Charlotte Wingfield shows her bronze medal in Tunis. With just one week to go for the inaugural European Championships for Small States at the Marsa athletics track, a team of four athletes, accompanied by coach Ivan Roshnov, are in Tunis taking part in the second edition of the Under-23 Games, organised by the Mediterranean Athletics Union. This competition pits athletics giants France, Italy and Spain with other renowned achievers Morocco, Egypt and hosts Tunisia, among the 27 participating countries on the Mediterranean littoral that also includes Kosovo. 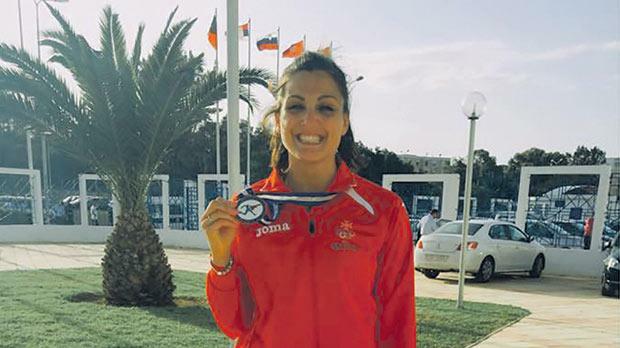 Considering the talent present, it was no mean feat for Maltese sprinter Charlotte Wingfield to take third spot in the 100m final on Saturday, the opening day of the competition. Wingfield’s time of 11.70 seconds was only one hundredth of a second away from her own national record she set at last year’s European Games in Baku, and underlines the fine form she is in at present thanks to her meticulous preparation. Carole Zahi, of France, claimed gold when clocking 11.28 seconds ahead of team-mate Floriane Gnafoua (11.38). Wingfield finished ahead of Egypt’s Bassant Hemida (11.72), Serbia’s Zorana Barjaktarovic (11.87), Turkey’s Berfe Sancak (11.90), Eman Elbashi, of Egypt, who clocked 12.48 and Tunisia’s Jihene Laabidi (14.11). In the 800m women’s final, Francesca Borg placed fifth in 2:17.46. Italy’s Eleonora Vandi won the race in 2:07.51. Sprinter Luke Bezzina was disqualified in the 100 metres after a false start. The Malta Athletics Association’s participation in these championships came through the assistance of SportMalta.